Yesterday I was talking with two friends and one said this plain simple statement and it spoke so much to me. 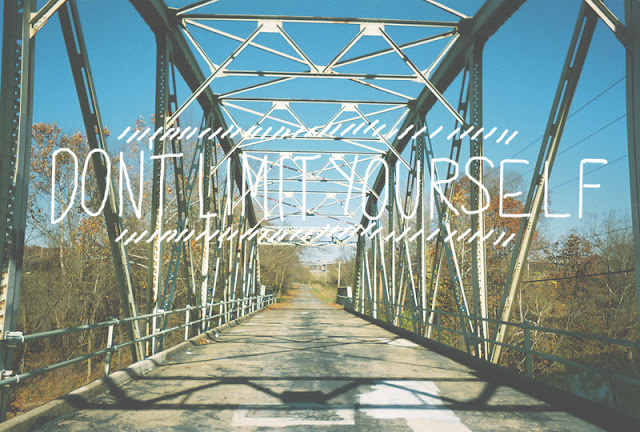 "Don't limit yourself." So many times I limit my thinking to I can only do one thing or I won't be able to do anything else to the best of my ability. I have freed myself from this way of thinking and am opening my horizons to be open to opportunities and choices in front of me. With that in mind, I still want to balance things and not overwhelm myself with busy-ness. I loved how simple these words fit in with a few things I am going through like trying to figure out what I am going to do next year for school. I don't want my dreams to be limited by the box that I so often tend to live in. I took the photo above with a disposable camera that I just got developed, they are my favorite and I will be sharing some more pictures with you soon. I hope this simple saying can fit well with you today.